$30.00 In stock - low quantity. Order in the next 15 hours, 42 minutes and it will go out today! In stock - low quantity. Order in the next 15 hours, 42 minutes and it will go out today! Make every business card a memorable memento by magically producing, printing, restoring or levitating it as you hand it out. 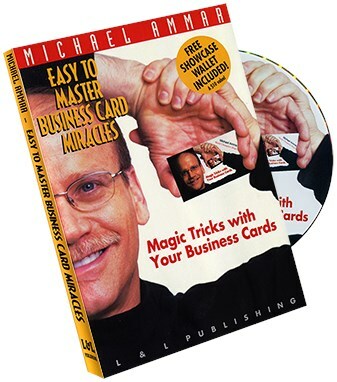 This is a powerful collection of magical surprises that can be performed with any normal business card. Thousands of business cards are handed out every day, yet the ideas taught here can make your business card unforgettable! Not only will you learn the best of the quick, surprising methods of presenting your card, but you will also learn the secret to Doug Bennett's Business Merger - possibly the most diabolically clever Torn and Restored Business Card ever. As a special bonus, you'll also receive a free Showcase Wallet. Thousands of these wallets sold for $10, which is perhaps the coolest, quickest and easiest method of all for magically handing out your business card.